When I saw this glazed black cod recipe in the June issue of Bon Appetit, the title alone convinced me to try it. 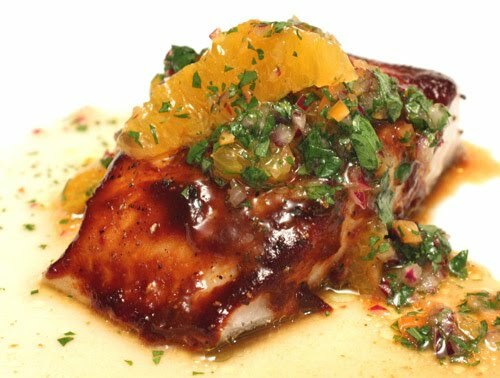 There’s a glaze that’s basted onto the fish while it broils, and then the fish is topped with a spicy, fruity salsa before serving. I do so enjoy a spicy, fruity salsa with fish, and a glaze involving tamarind was intriguing as well. Happily, black cod, also called sablefish, is a best choice on Seafood Watch. It’s a mild, white-fleshed fish, and halibut would also have worked here, and now that I’ve tasted the glaze and salsa, I think I’d like to try them with salmon too. The glaze is thick like barbecue sauce, and the tamarind adds a sour, tangy side to the mix of smoky, earthy, and sweet flavors. 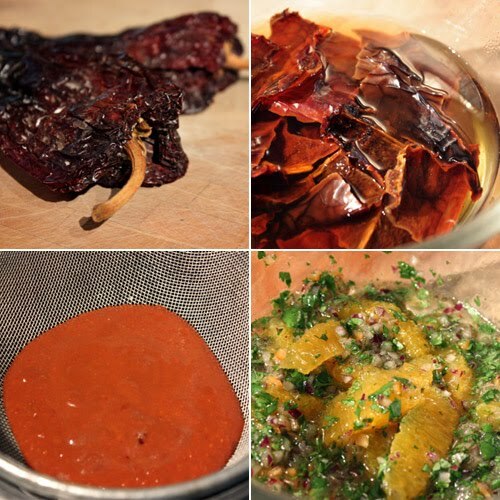 Ancho chiles were rehydrated and then pureed with orange juice, honey, garlic, tamarind concentrate, red wine vinegar, and olive oil. The puree was strained into a saucepan and then simmered until thickened. The glaze and the salsa can be made in advance making this a very quick dish to prepare at the last minute. The salsa included a seeded and finely chopped habanero, orange segments, cilantro, red onion, and red wine vinegar and olive oil. The fish was broiled for a few minutes on each side before the glaze was basted onto the top. It went back under the broiler for a couple of minutes until the glaze was bubbly hot. I like a quick and easy fish preparation using the broiler, but this would also be delicious, if slightly more time-consuming, cooked on the grill. The salsa was perfect for topping fish, and mango in place of orange would be another route to take with it. But, the tamarind glaze was the key element here. I’ll be using that again and again for fish, and it would be great brushed onto tofu or used as a sauce for barbecue chicken. Magnificent! I love the special flavor of tamarind. Too hot for my blood! I saw this one in BA too and immediately put it at the top of my list of things to make. (Problem is, even the top of my list of things to make is pretty extensive). You probably already know this, but Seafood Watch has phone apps now and you can also request a text of the current sustainable fish choices. After seeing this recipe I went out and bought a block of Tamarind. Haven't used it yet, but now that I see you've made it look so delicious, I'm going to get on it and make it. I'm going to take your suggestion and try it with the salmon. 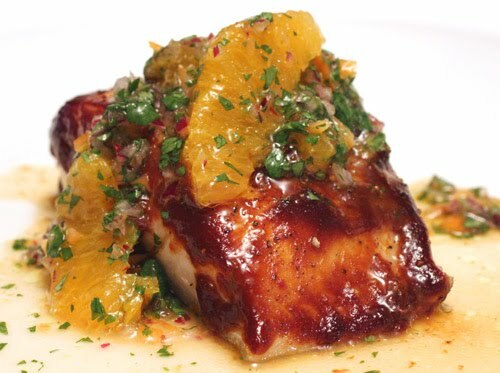 Such an exotic dish, tamarin glaze, habanero and orange salsa, this is truly wonderful flavor. What a lovely, vibrant recipe. I too will try it with salmon as you suggested. Thanks for sharing! I love Bon Appetit - such great recipes. This cod looks super delicious! Beautiful photo and I like the combination of heat and sweet. i love seafood watch, but still the word cod freaks me out...I will look for black cod next time. I think you're so right about the salmon. I mean, I think it looks fantastic with the cod. But the tanginess of the tamarind would pair so well with the fatty salmon. So good. Tamarind has one of those unique flavors thatr I love..
How delicious, it looks absolutely succulent! I plucked the same recipe out of the April issue and have stored it away for future use! Your cod looks delish I think I might have to give it a go! Beautiful dish and how I love tamarind. Can't wait to give this a try! I am drooling here. Yummy and mouth-watering recipe. Hmmmmm, I love black cod but sadly not easy to get in basel. Your dish makes me hungry. The glaze sounds absolutely amazing! I love the sound of this recipe, and look forward to trying it - thank you! The tamarind glaze looks fantastic and I love the spicy salsa too! Wow, Lisa, how do you come up with such amazing ideas and combinations?! I'm loving that glaze so much....I can think of so many ways to use it! Perfect! We love cod and this sounds delicious! Thanks for the recipe! Once again you've paired so many of my favorite flavors on a single plate. Can't wait to give this one a try. Thanks for this! Just back from the store & no tamarind paste, though. May have to use my dried tamarinds to figure out how to make the paste. Love the flavors in this and can't wait to mess around with it.